Mission cost less than was spent to produce Hollywood film "Gravity"
(CNN) -- The United States couldn't do it on its first try. Neither could the Soviets. In true underdog fashion, India launched its ultra-budget spacecraft and bested the Americans and Europeans by becoming the first nation to succeed in sending a spacecraft into Mars' orbit on its initial attempt. Twenty-four hours into India's entry into the elite space club, the Mars Orbiter Mission, also known as Mangalyaan, is circling the Red Planet and sending back data and photos to the command center. 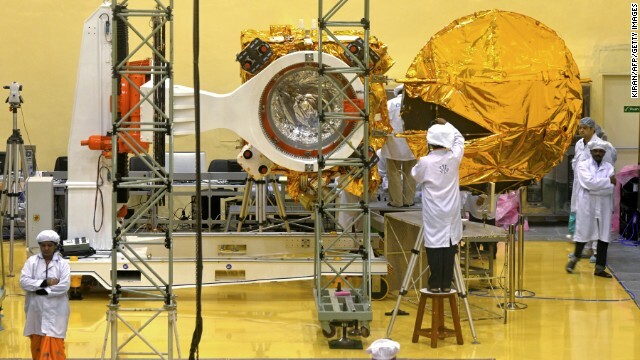 The Mars Orbiter spacecraft prepares for a prelaunch test at Satish Dhawan Space Centre SHAR in Srihairkota. 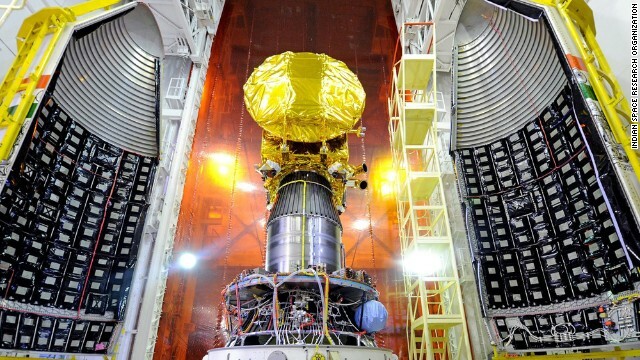 The Mars Orbiter spacecraft is pictured attached to the PSLV-C25 launch vehicle, with the heat shield open. 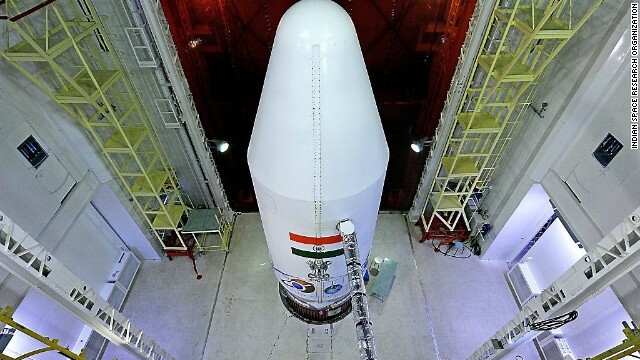 The PSLV-C25 launch vehicle is pictured with the heat shield closed. Scientists and engineers work on the Mars Orbiter vehicle at the Indian Space Research Organisation's (ISRO) satellite centre in Bangalore on September 11, 2013. 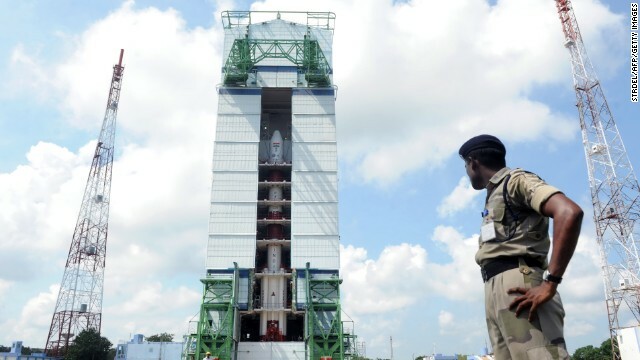 An Indian security forces member watches the PSLV-C25 launch vehicle carrying the Mars Orbiter probe as its payload on October 30, 2013. 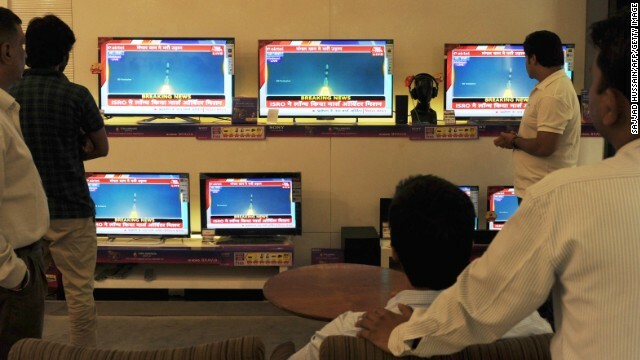 Indian bystanders watch a bank of screens showing the live telecast of the launch of India's Mars Orbiter Mission inside a showroom in New Delhi on November 5, 2013. The PSLV-C25 launch vehicle, carrying the Mars Orbiter probe as its payload, lifts off on November 5, 2013. The much-repeated phrase is that the Mars Orbiter Mission at $74 million cost less than the $100 million budget for the Hollywood space thriller "Gravity." At least "Gravity" earned a few Academy Awards. India's Mars mission actually cost a lot less than most of this year's Hollywood summer flops -- some of which you probably don't remember. For example, the budget for Tom Cruise's flick "Edge of Tomorrow" could have funded two India Mars mission with its whopping $178 million budget. India has built a reputation for its frugal innovations. 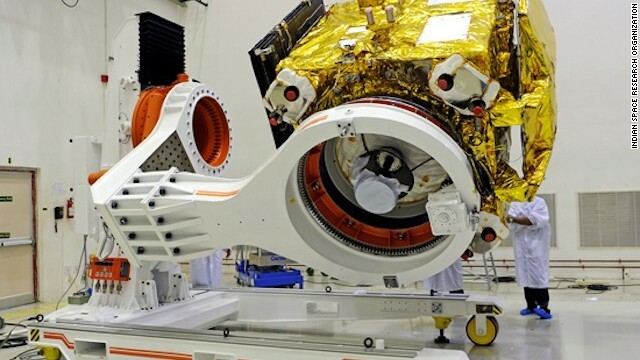 CNNMoney explains that the Indian Space Research Organization (ISRO) was able to save money by using short development cycles and taking advantage of India's cheap labor market. For example, highly-skilled aerospace engineers in India might receive a salary of $1,000 per month, a fraction of what they could earn in Europe or the U.S.
India's then-Prime Minister Manmohan Singh announced India's Mars aspiration in August 2012. In a rapid turnaround, the ISRO worked at breakneck speed to engineer, assemble and launch the Mars Orbiter. 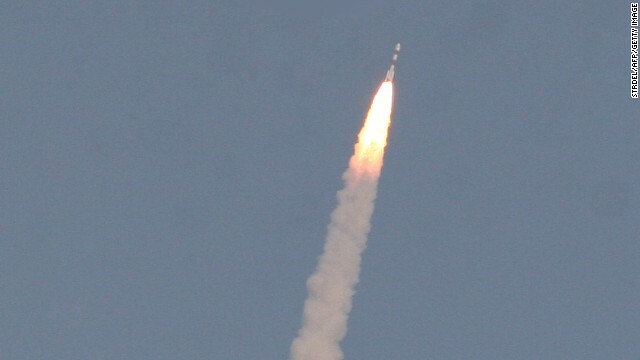 By November 2013, it launched from Chennai and 10 months later, it reached Mars' orbit to inspire a nation. From announcement to execution, the Mars mission took India's space agency two years and one month. In comparison, NASA's MAVEN was announced in September 2008, and reached the planet's orbit earlier this week -- taking six years. In a Forbes interview from 2013, ISRO Chairman Dr. K. Radhakrishnan said that India's space scientists commonly work 18-hour days and even 20-hour days during launch period, which made them more time and cost effective. The Mars spacecraft will orbit the Red Planet, mapping its surface and studying the atmosphere. The observation has already begun using its scientific instruments, according to ISRO. For much of its 50-year history, India's space program has prioritized developing technological capacity to help its population, such as improving its telecommunications infrastructure and environmental monitoring with satellites. 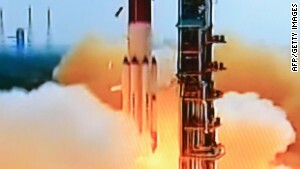 India's space program launched its first Earth satellite in 1975 and put an unmanned probe into orbit around the Moon in 2008. These days, if your spacecraft doesn't have a social account with a quirky personality, it might as well not exist. The Mars Orbiter's new Twitter account casually greeted NASA's Mars Curiosity, "Howdy... Keep in touch." Howdy @MarsCuriosity ? Keep in touch. I'll be around. It joined an elite club of recent space darlings like NASA's Curiosity and China's defunct Moon rover Jade Rabbit, whose popularity soared due to a blend of cheeky and scientific social media posts. In a country where one in three people lacks basic amenities like electricity, not all could cheer India's interplanetary aspirations. The statistics are sobering: one out of three malnourished children in the world lives in India. It faces development, poverty, education and gender challenges. Some critics have said that India should channel its funds into helping people here on Earth. And another criticism is that one of Earth's biggest environmental offenders has ignored the costs to the planet to go explore another. An uncrewed test flight will send Orion 3,600 miles above Earth, farther into space than any craft designed for astronauts has gone since the last Apollo moon mission more than 40 years ago. The University of Colorado Boulder has announced a discovery 7,200 miles above Earth of a protective shield similar to the force fields you might see in "Star Trek." The International Space Station's 3-D printer will create objects that can be used by those living in the station. Shrimp crawling around rock chimneys spewing hot water deep in the Caribbean Sea may hold clues to the kinds of life that can thrive in extreme environments on other planets, NASA says. It's hard to top the tricky, first-ever landing on a comet but we'll try. Here are 11 other space missions to know about. Add another entry to the growing list of crazy footage captured by GoPro cameras. Space accidents deter pioneer tourists? It is in our DNA to explore the unknown. But pushing boundaries and exploring space is far from easy. If there's one thing we've learned about the CNN iReport community, it's that you all love to capture celestial events. Want to ride an elevator into space? A breakthrough in nanotechnology could mean we will be riding into space on a cable made of diamonds. Astronauts lie motionless in a row of compartments with medical monitoring cables connected to their bodies, as their space ship cuts through the silent blackness. Scientists are closer to seeing a vast, invisible universe as a spectrometer in Earth orbit picks up possible clues of dark matter. Scientists believe that a hot gas bubble was formed by multiple supernovas. Life aboard the International Space Station. NASA's New Horizons mission hurtles toward Pluto in historic 3 billion mile expedition. Scientists looking for signs of life in the universe -- as well as another planet like our own -- are a lot closer to their goal than people realize. If you think you saw a flying saucer over Hawaii, you might not be crazy -- except what you saw didn't come from outer space, though that may be its ultimate destination. When I first poked my head inside Virgin Galactic's newest spaceship, I felt a little like I was getting a front-row seat to space history. From a sheep ranch in Western Australia comes the oldest slice of Earth we know.